Your description of the luncheon was delightful. The difference between psychosis and culture is only quantitative–the number of victims. The winter dance continues here—snow-shoveling the ice, skiing, tracking deer prints through the woods. Watching the moon arise over the skating lake. The white landscape is picture-post-card. We are busy finishing up the books. We are launching a messenger baloon [sic] filled with wise words (if there are such) to float down to the planet. The theory is that by giving people new words you will expand their consciousness and prepare them for further expansion. For this reason we are booming the word ECSTASY. We are starting a new science: Ecstatics. The science of consciousness. There are only two sciences: physics (the outside) and ecstatics (the inside) althoo [sic] both are eventually reducable [sic] under the Einsteinian equation. An Ecstacist is one who develops the new methods for producing ecstasy and describing it. An Ecstatician is a practioner [sic] who makes a lot of money and forms professional societies for producing the ecstasies. An ecstatogenic agent…you understand. The ecstatic unit is called the Huxley: which is defined by a French scientific association as the smallest discriminable ecstatic experience. Miss you much. We’d love to have your friend come; but his friend Paul should come too to be with him and to be with us. You have so many ecstasies still to come with Jessica. Beautiful. Great. Give a hug to Charlene. Love to you both. 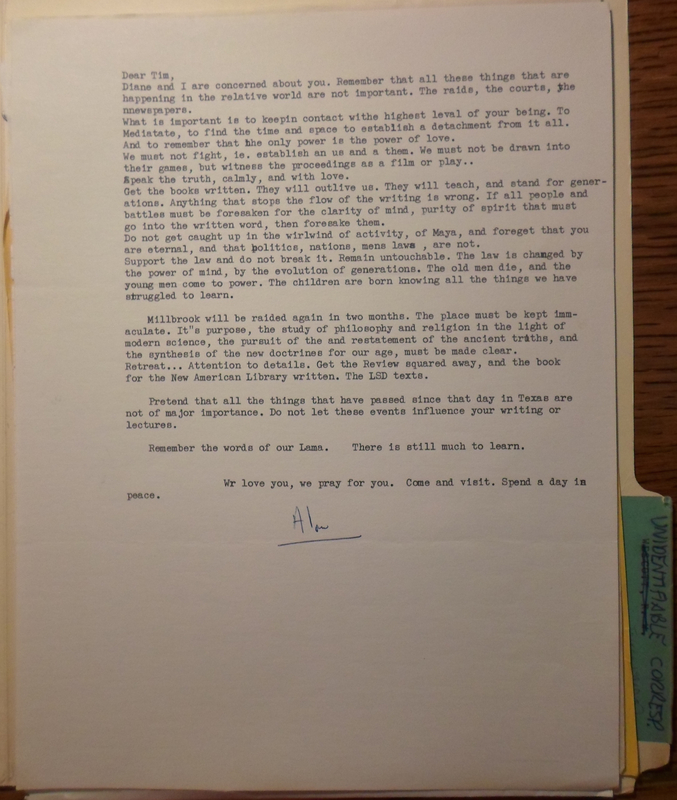 Leary’s 1964 letter – written from the Millbrook estate after his dismissal from Harvard – demonstrates his shift towards experimenting creatively with language. 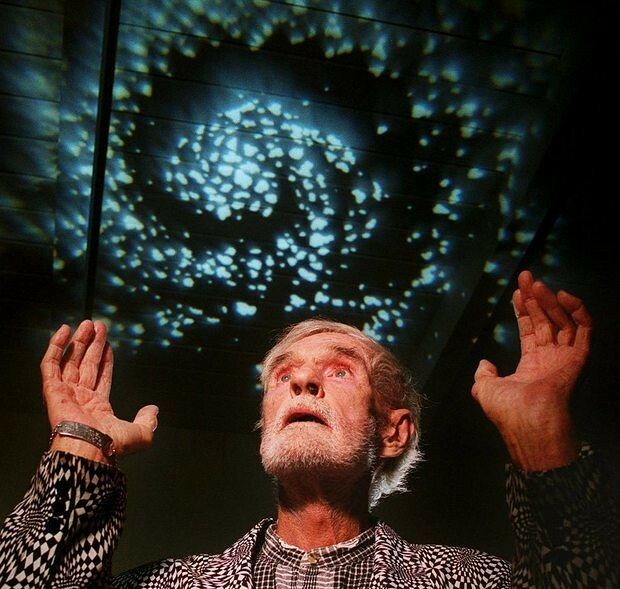 Leary’s interest in poetics developed out of his psychedelic research, where he confronted the creative challenges inherent to any project of mapping non-ordinary realms of subjective experience. Leary mirrors Romantic poet Percy Shelley’s conviction that new uses of language expand consciousness by “mark[ing] the before unapprehended relations of things and perpetuat[ing] their apprehension” (Shelley, “A Defence of Poetry,” 1821). As an instantiation of this interest, Leary plays with the concept of “ecstasy” in a manner that pushes back against the encroachment of behaviorism in the sciences. Behaviorism – which gained increasing ascendency in scientific discourses during the twentieth century – insisted that science could only investigate observable behavior, denying the possibility of discussing subjective mental processes. At its most extreme, it even denied the existence of such mental processes altogether. Behaviorism appealed to psychologists for its rigorous methodology, offering the approximation of a “hard” science at a time when psychology was vying for legitimacy. The magnitude of behaviorism’s ascendency is evident in psychology’s leading reference books, which avoided the terms “introspection” and “consciousness” until the late 1980s. This aversion to the science of subjective experience contributed to the disappearance of psychedelic research after the 1970s. Leary pokes fun at this attempt to mechanize human psychology with his description of “the smallest discriminable ecstatic experience,” offering a tongue-in-cheek, pataphysical caricature of modern science’s attempts to reduce subjective experience to rigid formulae. In contrast to the reductionist behaviorist, Leary’s “Ecstacist” is described in terms that mirror the role of the Romantic poet: “one who develops…methods for producing ecstasy and describing it.” As I explain in a forthcoming article – “Medical Ecstasies: Chemical Synthesis and Self-Experimentation in Romantic Poetry and Science” – Romantic poets adopted the formal method of self-experimentation to test the repeated effects of an independent variable (whether a psychoactive chemical or natural scenery) on the experimenter’s (and ultimately, the reader’s) body and mind. These poets would subsequently package these variables in poems explicitly designed to disseminate ecstatic experiences to others. Diane and I are concerned about you. Remember that all these things that are happening in the relative world are not important. The raids, the courts, the nnewspapers [sic]. What is important is to keepin [sic] contact withe [sic] highest leval [sic] of your being. To Mediatate [sic], to find the time and space to establish a detachment from it all. And to remember that the only power is the power of love. We must not fight, ie. establish an us and a them. We must not be drawn into their games, but witness the proceedings as a film or play.. Speak the truth, calmly, and with love. Get the books written. They will outlive us. They will teach, and stand for generations. Anything that stops the flow of the writing is wrong. If all people and battles must be forsaken for the clarity of mind, purity of spirit that must go into the written word, then forsake them. Do not get caught up in the wirlwind [sic] of activity, of Maya, and foreget [sic] that you are eternal, and that politics, nations, mens [sic] laws , are not. Support the law and do not break it. Remain untouchable. The law is changed by the power of mind, by the evolution of generations. The old men die, and the young men die, and the young men come to power. The children are born knowing all the things we have struggled to learn. Millbrook will be raided again in two months. The place must be kept immaculate. It”s [sic] purpose, the study of philosophy and religion in the light of modern science, the pursuit of the and restatement of the ancient truths, and the synthesis of the new doctrines for our age, must be made clear. Retreat… Attention to details. Get the Review squared away, and the book for the New American Library written. The LSD texts. Pretend that all the things that have passed since that day in Texas are not of major importance. Do not let these events influence your writing or lectures. Remember the words of our Lama. There is still much to learn. Wr [sic] love you, we pray for you. Come and visit. Spend a day in peace. Historical notes: In December 1965, Leary and his teenage daughter were arrested for marijuana possession in Loredo, Texas. G. Gordon Liddy led the first raid on Millbrook (Leary’s New York commune) in April 1966, half a decade before Liddy would earn notoriety for the 1972 Watergate scandal. Subsequent raids on Millbrook would ultimately lead to the commune’s dissolution around the end of 1967, proving Alan Marlowe’s forewarning prophetic. This letter is significant for its emphasis on the importance of language in shifting cultural consciousness about psychedelics. Leary would go on to publish High Priest – his poetic, autobiographical chronicle of psychedelic self-experimentation – with New American Library in 1968. 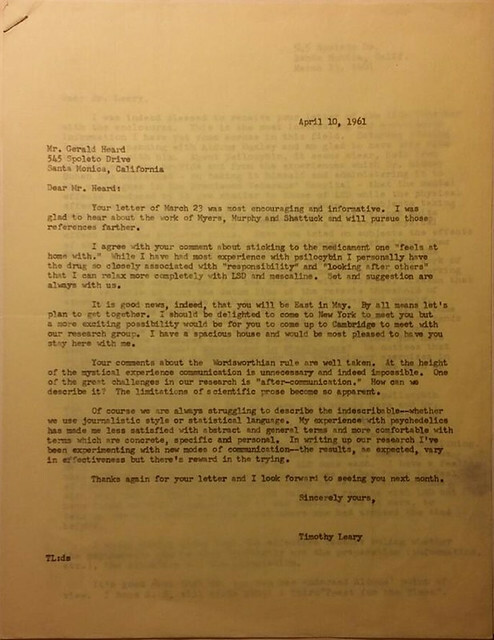 Timothy Leary wrote the attached letter to poet George Andrews as an early attempt to “language” his subjective experiences with psilocybin (magic mushrooms). Leary cites Plato’s Allegory of the Cave as a literary predecessor of his psychedelic research–an analogy that would reappear throughout Leary’s writings on psychedelics in the 1960’s. Your letter arrived out of a clear blue sky, like a bolt. How (on earth) can I answer your question? And what does it mean if I tell you that I have seen the Beginning in a mushroom vision, where there were all kinds of strange things going on and very different to what we read about in history books; indeed, the least extraordinary personages were those outer-space people, who seemed only intent on mapping the earth and pursuing ape-women up and down the valleys of the Himalayas. Having said that, you will understand my difficulties here. However, I shall attempt an answer of sorts. In the Beginning, all was static; the earth was neither fire nor solid. It was a drop of water on someone’s kitchen table: an instant between the action of spilling and some future cleaning-up. Or, perhaps, the earth is a barnacle on a rock, formed between two waves; an event of no significance, then, created in a vacuum between the ebb and the flow of some unthinkable, unimaginable sea. And man evolved in one billionth of a second; still less, will he disappear. And then another wave will sweep across the rock, and another barnacle will be created that is also the centre of a Universe. And so on, even down to the Hotchkiss-Yale-Brooks bros. suit-sneering barnacled-smile. But what strange events took place in this one billionth of a second – cities were built in the image of the human-cortex; religions were invented to explain the kitchen table; the stars are the reflection of distant electric light-bulbs; Tangiers is the figment of your imagination; mushrooms are eternally high; Times Square is a grain of sugar on a plastic hard-top……We are in a cave of shadows, a subway ride with other shadows for company. And at any minute we can decide to leave the cave, come out into the sunshine of another existence that dazzles our eyes. But who will believe us when, upon our return to the cave, we tell of another world far more real in its magnificence than the accustomed half-light we call this shadow-earth. Here, then, is part of the Platonic parable, which you must read. It is one of the best metaphorical descriptions of man in a state of expanded awareness, of his difficulties to communicate to his fellow-man what he has seen beyond the cave, and of his joy, despair and amazement at all of this. You will find it in the 7th Book of the Republic. On my final day with Tim Leary’s archive, I found the most explicit possible support of a major component of my project thesis (about the connection between psychedelic science research and Romantic theories of poetic composition) in a 1961 exchange between Leary and Gerald Heard. It was particularly interesting to know that the creative process can be specifically stimulated by psilocybin. What we have found here is that there is a tremendous stimulation of pattern and significance. But whether it be in painting or in writing, the Wordsworthian rule has seemed to be in action. The work of art is precipitated when ‘the emotion is recollected in tranquillity.’ While the emotive power is working the wealth of imagery is so abundant that the selective and limiting powers of composition seem unable to impose themselves or the experient feels uninclined to impose this limitation. Your comments about the Wordsworthian rule are well taken. At the height of the mystical experience communication is unnecessary and indeed impossible. One of the great challenges in our research is “after-communication.” How can we describe it? The limitations of scientific prose become so apparent. […] My experience with psychedelics has made me less satisfied with abstract and general terms and more comfortable with terms which are concrete, specific and personal. In writing up our research I’ve been experimenting with new modes of communication–the results, as expected, vary in effectiveness but there’s reward in the trying.